Beacoo Apple watch stand & iPhone stand made by durable ABS material. The Apple Watch stand is perfectly designed to accommodate your Apple Watch magnetic charger allowing for easy docking and charging of the AppleWatch, the Innovative Sliding Block, which is adjustable up and down as you rotate the knob on the back of the stand, make the stand easily compatible with almost every AppleWatch (whether naked or wearing case) on today market, aligns the AppleWatch center with the center of Apple Magnetic Charger to make the charging more efficient. 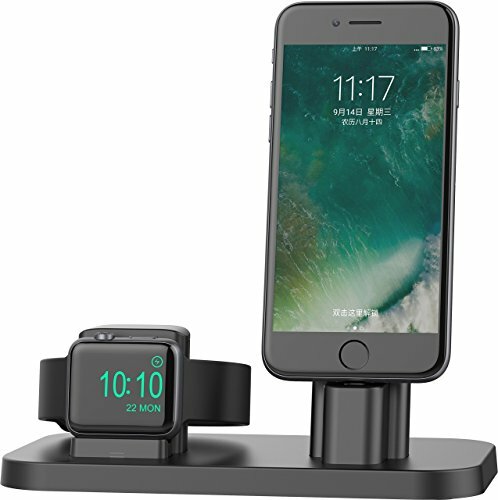 The iPhone Charging Stand works exclusively with your Apple Lightning Cable (not included) and conveniently turns it into a charging dock for your desktop or nightstand. Showcases your device for sturdy, hands-free interaction like Face Time.skype There 2 height-adjusting cable clips allows stand to work with most cases on the market today - especially those with recessed connections that no other dock can fit Rear adjustable sliding block will fit 99% protective cases in market. such as spigen.Speck Candyshell.Griffin Reveal.otterbox lifeproof fre. Anti-slip spots on the bottom of the product availably enhances the stability, keeps the whole unit more secure.